Over the past year, I’ve been privileged to partake in the ever-expanding marketing efforts of the Royal Canadian Mint. Recognized as one of the top mints, they lead the industry with innovations like holograms, Swarovski crystals, unique shapes, painted imagery, and extreme high relief. Even more impressive, the Mint holds the Guinness World Record for the world’s largest gold coin, a100-kilogram/220-pound, 99999 pure (yes, that’s five nines, 99.999% pure) gold bullion coin with a face value of $1 million. 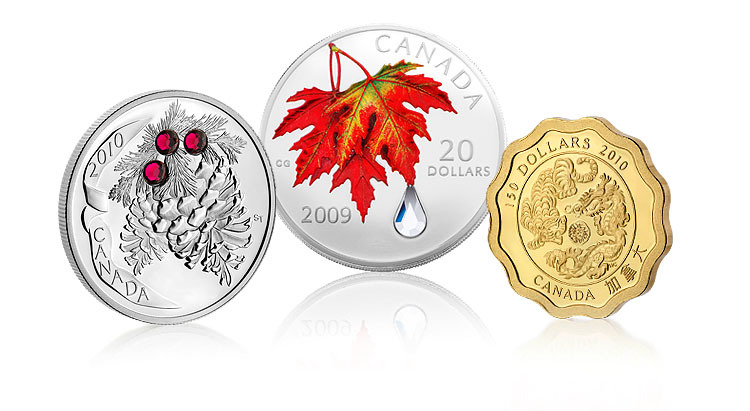 Beyond Canada’s own currency, the Mint also produces that of 50+ countries, providing a significant revenue source in addition to its circulation and collection-based coins. For the last several years, the Mint featured beautifully painted renditions of their coins, with artists necessarily taking liberties with regard to highlights, shadows, and design elements visible in real life. With the price of some of these stunning coins in the six-figure range, high-profile collectors required an authentic view of their possible purchase. That’s where the need for high-definition photography came in. The Mint went on the lookout for a photography studio that is well versed in the capturing the allure of various precious metals and how to retain and display fine details in all their glory. A selective aging effect creates a powerful impression of fossilized bones in stone. In fact, this technique ensures no two coins are exactly alike. While on location in Ottawa last spring, I was totally blown away with the beauty of the artwork -- these coins were not your typical circulation-based denominations. Each year, renowned artists design and hand craft incredible works of art that appear virtually three-dimensional. Heck, even Queen Elizabeth looks stunning on some coins! We faced a challenge during the shoot: photographing a coin featuring a hologram. This isn't something I had ever come across in the world of jewelry photography, my bread and butter, and needed to do on-the-spot learning to overcome this anomaly. Softboxes don't work - they simply wash away the effect. Only a handheld strobe without any light modifier was able to retain the holographic effect through my lens. Back at the studio later, we composited the best images in post-production to produce a final product the Mint was proud of. Since then, the Mint and EpicMind have collaborated on several collections and projects, including redefining the Masters Club magazine – a publication that targets the Mint’s most avid and loyal customers throughout North America. We look forward to capturing the Mint’s latest innovations with photography and videography in the coming years. I also want to mention that the next blog entry will be featuring a new column called "Beginner's Corner". It will talk about the various technical aspects of studio work, such as lighting options, basic camera usage and more. I will be also including some jewelry photography tips. So check back soon!